Commonly used for: 0% APR, Business, Excellent Credit, Low Interest. 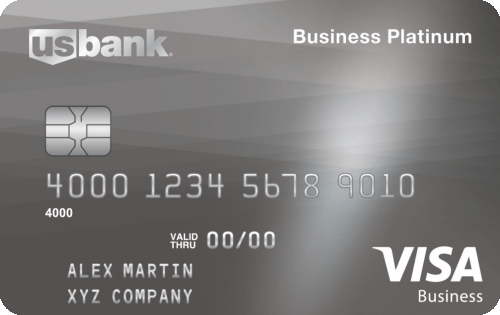 The plain-vanilla card Business Platinum Card offered by U.S. Bank is about as stripped down as it gets. There’s no annual fee and also no rewards. What is does offer is the Visa Savings Edge program, which gives discounts ranging typically from 1% to 5% at select merchants. It’s challenging to find a reason to pick the Business Platinum card over one of U.S. Bank’s three other business cards: U.S. Bank Business Cash Rewards World Elite MasterCard, U.S. Bank FlexPerks Business Edge Travel Rewards Card and the U.S. Bank Business Select Rewards Card. All three have more to offer. Each of the four cards offers a discount on select retailers through the Visa Savings Edge Program. Visa’s program has a wide range of retailers but how much of an advantage it is comes down to the merchants you typically use. If you spend big on hotels, MailChimp or gas stations, for example, then this program might be right for you. But unlike the Business Platinum Card, the other U.S. Bank Business cards all offer rewards on spending — ranging from 1 to 3 points in various categories. The only thing the Business Platinum has that the other cards don’t is a slightly longer 0% APR offer on purchases and balance transfers (12.24% – 20.24% variable after that) and the opportunity to qualify for a slightly lower APR. This doesn’t even take into account the advantages other small business cards may have over the Business Platinum Card, like sign-up bonuses, no foreign transaction fees and higher rewards rates. We judge this card pretty harshly, but only because it doesn’t stand up to most business credit cards on the market today. Business owners with good credit have come to expect a card that offers a good combination of APR and rewards/sign-up bonus. This card isn’t it. Someone who spends a lot at one of the discounted merchant categories and would like a one-year break on interest charges may benefit from this card. This card comes with an introductory 0% APR offer on purchases and balance transfers for the first 20 billing cycles. After that it’s a variable 12.24% to 20.24%*. This card is part of the Visa Savings edge program, which gives automatic discounts at select retailers including hotels, computer supplies, gas stations and mailing services. Additional employee cards are free. Balance transfers will be assessed a 3% fee. Enjoy 0% APR for the first 20 billing cycles on purchases and balance transfers. After the intro period expires, your regular APR will be a variable 12.24% to 20.24%. You’ll pay a 3% fee (or $5 minimum) on balance transfers. You’ll be charged a 3% foreign transaction fee on all purchases made outside the U.S. If you pay late or miss a payment, you may be subject to a variable 29.9% penalty APR, which will apply for a minimum of six months, plus a late payment fee of up to $39. The card offers online access to a breakdown of your spending by category. You may enroll in Visa Savings Edge discounts, which offers savings at dozens of partners, including hotels, rental cars, dining and technology services. There are no points or rewards with this card.